This first special edition podcast features a live set by Boston's own Rise Set Twilight (Linda Aubry and Mike Bullock). 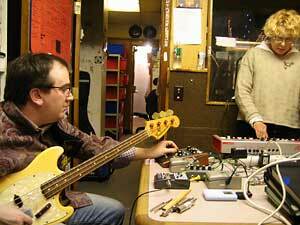 Linda and Mike performed live in the WZBC studio on Thursday, January 12, 2006. Check out my interview with Linda and Mike here and take a look at some photos from the performance here. Rare Frequency Podcast (Special Ed. 01): Rise Set Twilight Live! Just listened to this at work. Very nice indeed. If you use iTunes, you can subscribe to the Rare Frequency podcast by following this link. Podcast Special Ed. 44: Strotter Inst. "The Strange Sounds of the Bean and the Cod"
Rare Frequency Podcast 2: "Some Toys Never Lern"
Rare Frequency Podcast 1: "984 Precedent"